Without beating around the bush, let me begin this short blog by letting everyone know that we survived Hurricane Irma with MINIMAL DAMAGE. This hurricane wobbled and changed directions more times than a drunken sailor. When we went to bed on Sunday night, the last forecast we had was that the eye would pass directly over Camilla, Georgia with sustained hurricane force winds of 75 mph and gusts up to 90 mph. Our greatest fear at that stage of the game was how many thousands of acres of pine trees would have the tops snapped off or trees completely blown down. Sometime during the wee hours of the morning, the eye of Irma wobbled a bit more to the east. Additionally, the eye stayed over land for a longer period of time rather than hugging the west coast of Florida. This tremendously helped us in the reduction of power in wind speeds. Since this was a fast moving hurricane, we never were concerned about the Flint River flooding. As a matter of fact, we only received a shade over two inches of rain. It appears that southeast and even north Georgia have suffered more extensive damage from Irma than we did here at Riverview. We had absolutely no structural damage to any cottages or homes on the property. I did have a gigantic hickory tree next to my home that fell with such force that I was certain that the rear end of our home was gone. That’s why we always let company sleep in the back of the house. Years ago, I had taken all of the limbs off of this giant that was on the house side of the tree. Praise the Lord, it fell away from the house, but the entire house shook from the force of this monster hitting the ground. We have a great group of employees and all of the equipment we need to have everything looking spotless again before the weekend. 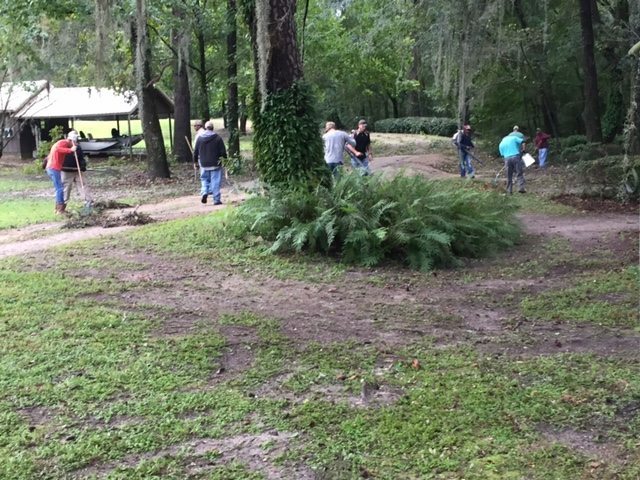 Right now we are mostly raking debris and picking up small limbs scattered from one end of the lodge grounds to the other. We also have a man on our front end rubber tired loader going through all of our woods roads to check for any trees that might have blocked any roads. I’m not real certain why Cader IV is having this done as I have never seen an employee do a thing except swing out in the woods and circle back to the road if a tree was down. It has always been one of my pet peeves that we will establish a new trail rather than clear an existing one. We did lose 70 acres of an experimental crop, but we had insured it for wind and hail when we saw how tall it was growing. Our soybeans appear to have fared well, and all of our food plots should stand back up completely after a few days of sunshine. Only a few of my “mature” guests might understand my biggest problem. Martha and I spent a good part of Saturday and even Sunday afternoon picking up and storing all of the items in our yard, on our patio, and on our porch. Now that the storm has passed, we need to place everything back where it belongs. We have laughingly said that we have almost reached the age where we can hide our own Easter eggs. The big pieces of furniture, chairs, grill, etc. were no problem. However, Martha Cox has more trinkets and decorations than I can possibly remember hiding. We may still be searching for a few items for a while. The main thing I wanted to let everyone know is that God was merciful as far as Riverview was concerned. No one was injured, and we suffered no major losses. My heart breaks for everyone from the islands up through Florida, and even into Georgia where lives were lost and homes were destroyed. These folks are certainly in our thoughts and prayers. Also, I wish that Hurricane Jose would quit drinking, and decide which direction it plans to take.